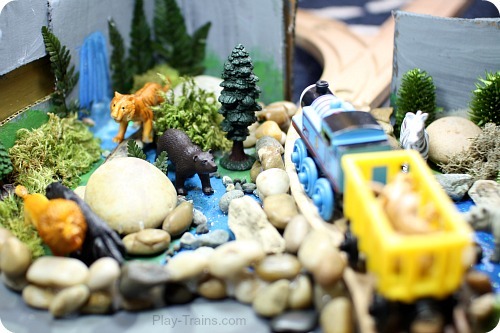 The Little Engineer has always loved having animal passengers for his trains, so it’s no surprise that we jumped at the chance to make a zoo for his wooden trains as soon as we had the idea! 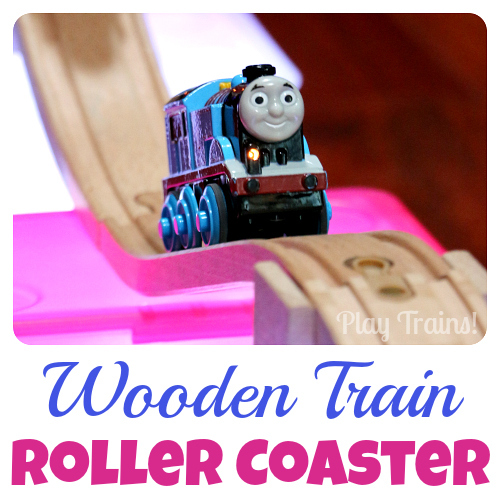 This is by far our most ambitious DIY wooden train set project yet, but it was well worth the investment of a little more time and money, especially since that time was spent being creative together. 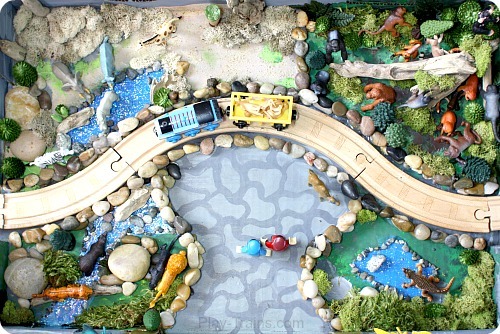 Now we have a permanent zoo train small world that can be easily incorporated into any train layout. We were provided with a gift card from Jo-ann Fabric and Crafts to use toward the supplies for our craft, so that we could share our experience making it and spread the word about their summer crafts. All opinions are my own. This post also contains links to Amazon.com. If you click on one, we will receive a small commission — at no additional cost to you — on anything you buy at Amazon for a certain length of time afterwards. Read our disclosure policy for more details. We didn’t think of the idea without a little inspiration. 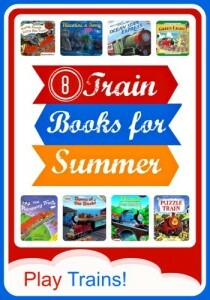 When we were first contacted by Jo-Ann Fabric and Craft Stores to participate in their summer crafting challenge, I was excited, but worried we wouldn’t be able to find a craft to fit with our focus on train play. 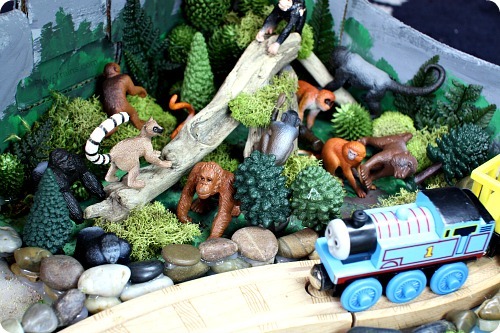 The Little Engineer and I looked through their extensive collection of ideas in the Cape Discovery craft catalog, and finally we spotted the very Jungle Diorama. Neither one of us could resist the lure of adding more Safari Ltd. Toobs to our collection after all the fun we’ve had with the Steam Train Toob and the more modern Train Toob. 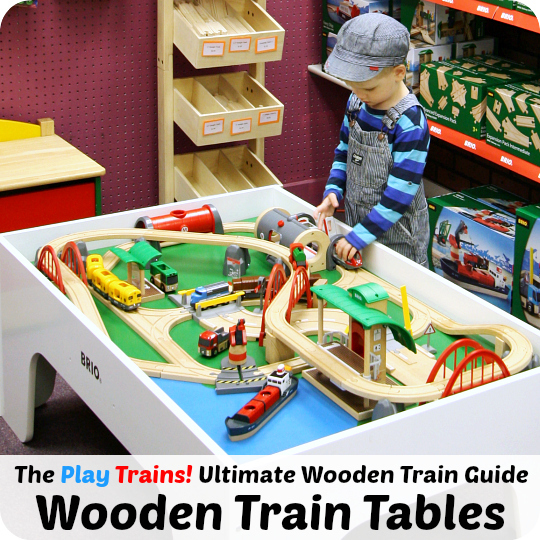 Instantly, we were brainstorming how we would create a zoo for our wooden trains. When I got to Jo-Ann with the supply list, my gift card from them, and a bunch of coupons in hand, I was a bit dismayed at the total cost of the recommended items. 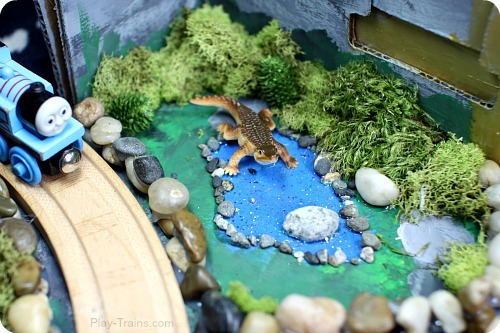 It is a really cool-looking craft, but I can’t see spending $80 or more on supplies for a child to make a diorama. That said, I think we just picked the one expensive craft in the catalog, because all the other projects I’ve seen in the challenge have seemed quite reasonable. Undeterred, I decided to do my best to make our version as frugal as possible. My coupons helped a lot with that — one of the reasons we end up at Jo-Ann so often! I took the supply list as a suggestion, trying to fill as much of it as possible with items we already owned. 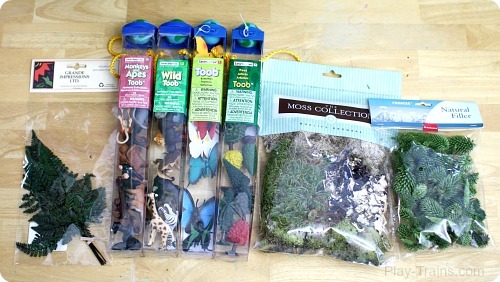 I ended up spending around $32 on supplies, mostly going toward buying the four Safari Ltd. Toobs from the list — the Wild Toob, Monkeys and Apes Toob, Butterflies Toob, and Trees Toob. Considering how much a Thomas & Friends destination costs, I felt this wasn’t too bad for a whole zoo with lots of possibilities for play. Also, because we’re not gluing the animals and trees down like the directions say to do for the diorama, we’ll be able to play with them in lots of other ways and contexts in the future. Now that we’ve finished the zoo and seen how it gets played with, I think you could get by with just the Wild and Monkeys and Apes Toobs to reduce the cost. 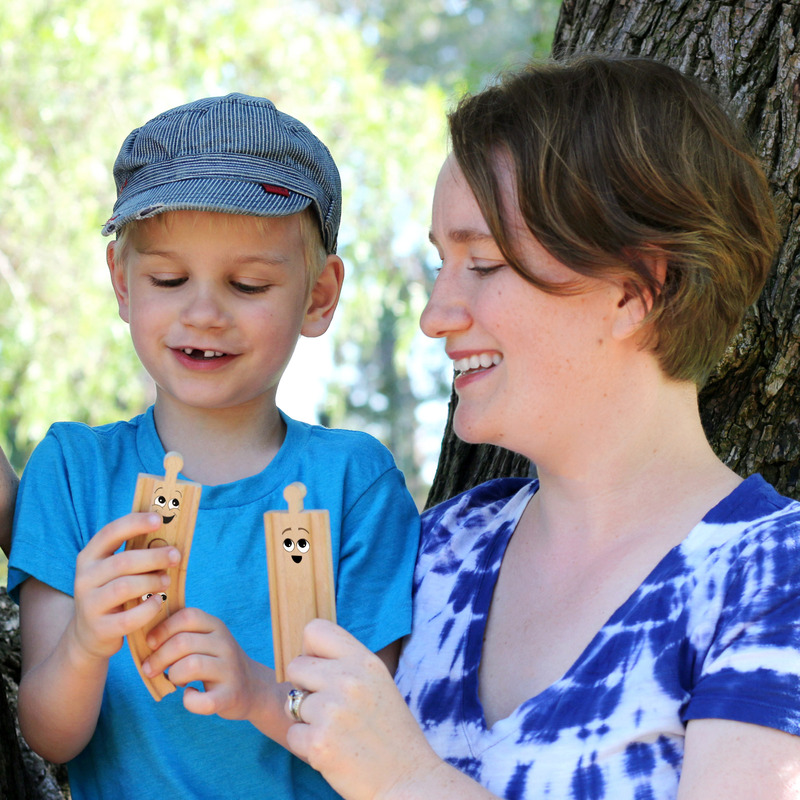 My son likes playing with the trees from the Tree Toob, but they aren’t essential. The butterflies are so cool, but they are out of scale for the wooden trains. I thought of a few ways to incorporate them as large decorations at the zoo, but they’re not necessary. In addition to the Toobs, I purchased dried ferns, the variety pack of dried moss I felt was most in scale to be bushes for the trains, and some spiky dried plants I found on clearance. That gave us more than enough vegetation to complete the zoo. I already had acrylic paints, a hot glue gun (this took a lot of hot glue, so make sure you have a full pack of hot glue sticks! ), blue glitter glue, some small and medium-sized polished rocks, and some small pieces of driftwood and tiny rocks we’d gathered the day we made our sand tracks at the beach. 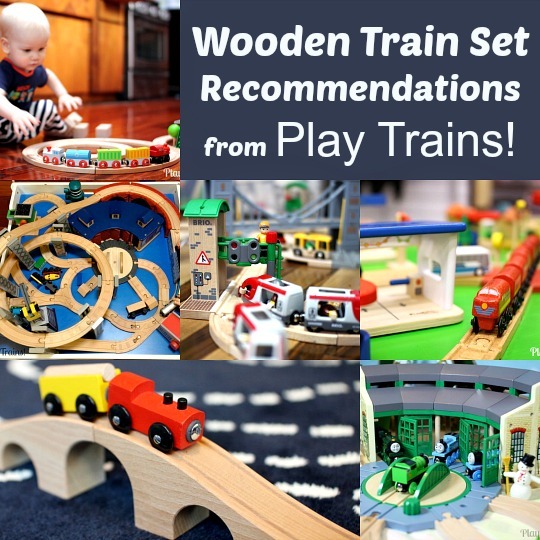 Plus, of course, the wooden trains, track, and accessories. 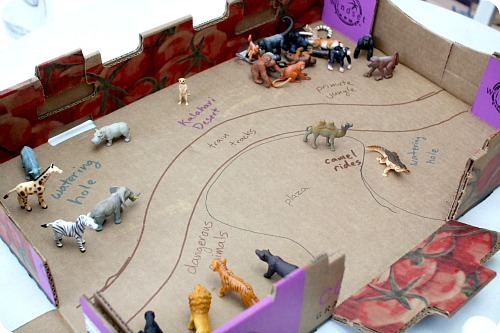 I wanted to evoke the box from the diorama by building our zoo inside a box. The sturdy, flat boxes we often get at the checkout at Costco are one of my favorite things to upcycle as train accessories. Usually, we turn them upside down, as we did for our recycled wooden train track platform, but this time we used it right side up. We flipped it upside down and loaded it down with a heavy tub full of train track for a few days to flatten the bottom out as much as possible. When we were ready to get to work, the first thing we had to do was plan where everything would go with some actual wooden track. I wanted to cut a front gate into one of the long sides of the box, and we needed to know where the track would go and the animal enclosures would be. As soon as we started playing around with the track inside the box, I realized there wasn’t room for anything complicated. I talked the Little Engineer into a simple curve through the zoo grounds, dividing four main animal enclosures and a plaza where people could watch animals and board trains. Once we had it figured out, I traced the shape of the track. (If I had to do it over again, I would mark an extra centimeter or two around the track as well so the enclosure walls wouldn’t be right next to the track.) Then I cut out the gate and places for the track to enter and exit the zoo. I had intended to remove the tabs entirely, but the Little Engineer liked being able to “close the zoo up for the night”, and they make it easier to keep the animals contained inside when you’re moving and storing the zoo. Next, we had to decide where the animals would go. The Little Engineer enjoyed this part, because he finally got to play with the animals from the Toobs! It was also a great time to talk about where the animals came from, what kind of habitat they would need, which ones might eat the others, and so on. We ended up planning a primate jungle, an enclosure for all the “dangerous animals” (good thing it’s a pretend zoo! ), an African watering hole, and another watering hole for the crocodile. He insisted having a meerkat habitat, so I added that onto the African enclosure. The camel didn’t quite fit in anywhere, so he decided to have camel rides in the plaza, inspired by the camel rides at a local zoo. 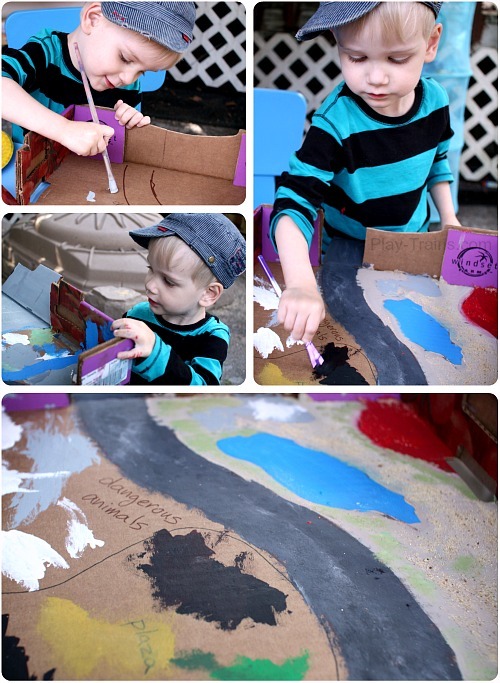 The planning complete, we went outside to paint the box together. 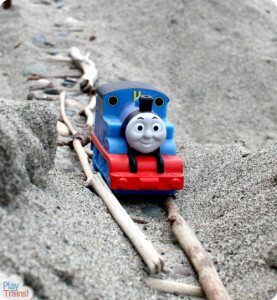 This was another step the Little Engineer especially enjoyed. I let him work on one end while I did the other. I left as much of his painting visible as I could as I filled in around his blotches of color. As we painted, I showed him what I was doing to get different effects — mostly dabbing my brush into a combination of colors to give the impression that there was more detail than there really was. It was fun to watch him try to emulate my techniques. I’ll go into more detail about how we painted the different areas of the zoo at the bottom of the post, but you can see the general idea here. The Little Engineer was quite captivated by the whole process! Despite the fact that it took an hour or more to paint, he was directly involved the entire time, always excited to add some new detail with me. Once the paint had dried, there was a final touch for the water: blue glitter glue. The Little Engineer tried really hard to squeeze it himself, but it was hard to get the glue out, so I ended up finishing for him. It worked best to squeeze some on and then spread it around with the tip of the glue bottle. Before the glue had a chance to dry, we pushed the tiny rocks we brought home from the beach around the edge and placed a few rocks and pieces of driftwood in the water. It looks surprisingly realistic! We let the whole thing dry for several hours. I had intended to wait until the next day to finish decorating the zoo, but the Little Engineer was so excited that he couldn’t wait, so I let him stay up a little late to help me finish. Teaching him how to use a hot glue gun is still on my list of things to do, and it was easy to end up touching the hot glue through the moss if I wasn’t careful, so I did all the gluing. I don’t have any pictures of this step. Between the lack of light for good photographs and needing to supervise my three-year-old around a hot glue gun (and, to be honest, my own relative inexperience with hot glue), I decided that it would be easy enough to see what we had glued where from the pictures of the final result, so look for my notes on those details at the end of the post. The next day, the Little Engineer could hardly wait to play. 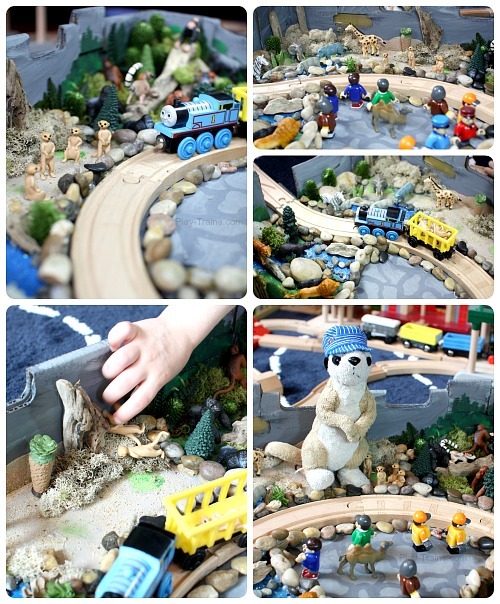 We quickly built a train layout incorporating the zoo, and he carefully added the animals to their habitats. We played out setting up the zoo several times, with the trains having to go down to the docks and bring animals, animal food, trees, and giant butterfly decorations to the zoo, not to mention providing some rides for the animals just for fun. We used little wooden cubes from another craft store as crates full of food, and he enjoyed pretending to be a zoo keeper feeding the animals. He also especially enjoyed giving the red Brio driver and the blue Brio driver a tour of the zoo. Like I said above, the trees from the Tree Toob aren’t entirely necessary, but the Little Engineer really did enjoy hauling them from the docks and placing them in the zoo. They fit very nicely in the freight cars, especially the inexpensive Circo ones from Target, which are a little longer than the others we have. 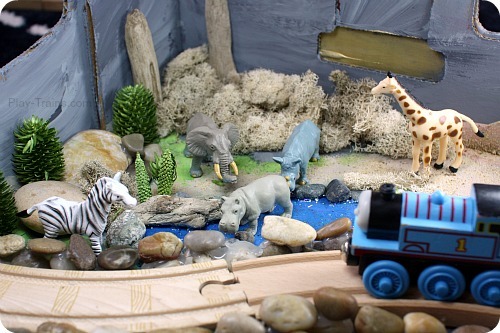 Once we added Sir Topham Hatt, Mr. Percival, and all of the Brio figures we could find, the zoo magically came to life! It was sort of amazing how the addition of people made it feel like a real, busy day at the zoo. Here are some notes on what we did for each section of the zoo. 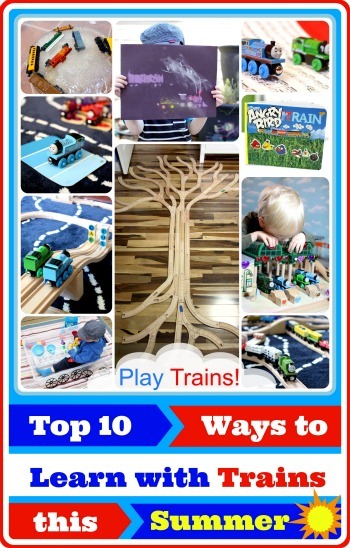 I hope they will help you in the creation of your own train zoo! 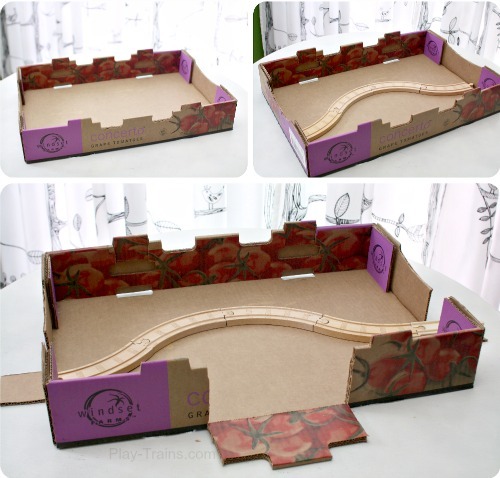 Extra cardboard piece: I cut an arch to go over the gate and, after painting and writing “Sodor Train Zoo” on it in black permanent marker, glued it above the gate. The sad thing was it stayed in place much better before I glued it, so if you can cut a tight enough fit, you might skip the glue. Paint: shades of gray for the walls and the stone plaza, greens for the trees growing around the walls both inside and out, gold for the gate. Rocks: the animal enclosures have walls made from small, polished rocks glued two-high. The wall between the plaza and the track is only one rock high, so people can board the trains. Butterflies: I used the butterflies from the Butterfly Toob as decorations along the top of the walls of the zoo, sort of just sticking them on. We also built a climber for children in the center of the plaza and then some statues for outside the gates by stacking and interlocking them. 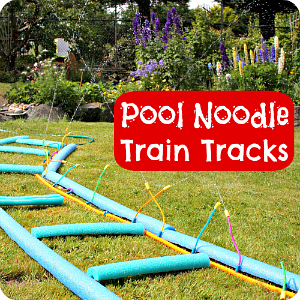 Tracks: Because I didn’t leave much extra room around the tracks, they got a little hot glue on them. It was easy to remove, only doing damage to the paint on the box under the tracks. 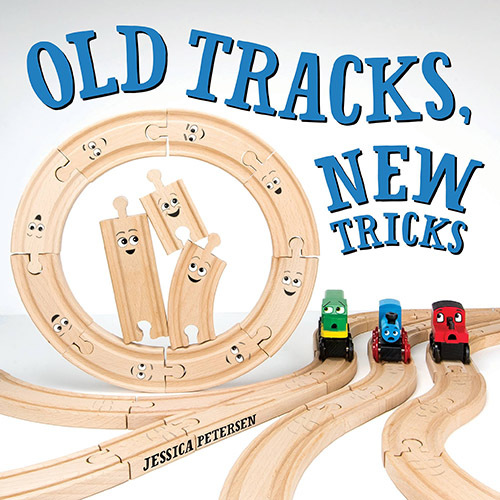 If you have extra pieces of wooden track, you might want to glue them down to the box, because the tracks have dislodged some of the rock walls as the zoo has been bumped and jarred within the train layout. Paint: sand-colored paint sprinkled with real sand while still wet (coming up onto the walls in a few places to give the idea of sandy hills), mottled yellow-green dabbed on for sparse vegetation, blue for the watering hole covered with blue glitter glue after the paint dried. Rocks & wood: driftwood and tiny rocks along the sides of the watering hole, longer pieces of driftwood glued to the walls as dead trees, a few larger rocks for animals to stand on. Vegetation: spiky green plants near the watering hole, dry-looking tan moss all over the place. Paint: greens for grass and undergrowth as well as the bushes on the sides, blue for water, blue and white for the waterfall cascading down into the river. Rocks and driftwood: tiny rocks and driftwood along and in the river, a few big rocks for the animals to climb on, a long piece of driftwood going over the river as a bridge. Vegetation: lots of green moss for bushes, dried ferns glued to the walls as distant trees. Paint: browns for the ground, mostly covered by a mix of greens all over the ground and up the walls of the habitat. Rocks and driftwood: lots of pieces of driftwood built up into a climbing structure for the monkeys and apes. Vegetation: lots of moss bushes and spiky plants, dried ferns on the walls for trees, and a “tree” built in the corner from a whole bunch of the spiky plants. 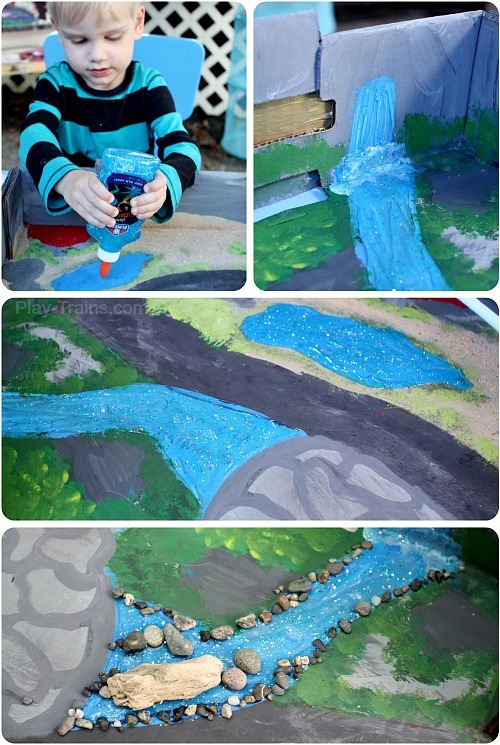 Paint: deep greens for lush plant cover all over the ground, blue for the watering hole covered with blue glitter glue after the paint dried. Rocks and driftwood: tiny rocks around the watering hole. Vegetation: lots of moss and a few spiky plants around the back walls of the enclosure. We just love our train zoo. 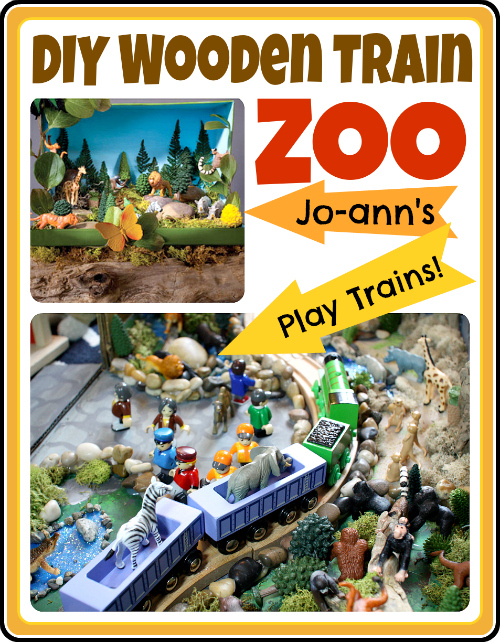 Thank you to Jo-Ann for inspiring and helping us to create this wonderful addition to our train set! LOVE this idea! 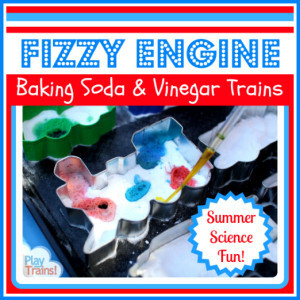 Thanks for sharing this activity with soooo much detail! I believe our 4 year old granddaughter would absolutely LOVE this! My husband and her Pop-Pop, Jon, is a graphic artist, and I bet she and he would really enjoy this project! Blessings to you! Aw, thanks, Judy! I have to tell you that this post took me forever to finish, but your comment just made it worth all the effort. I hope they have a ton of fun making and playing with it! You won’t believe this!! I went to our local JoAnn’s store last evening to check out the Toob sets used in your activity. They just moved from a much smaller location into a larger location in May. Anyway, I found the Toob sets, and the Monkeys & Apes set was on clearance for $1.97!!! But, alas, the hook was empty. 🙁 But I DID purchase pandas on clearance for $2.97, and will probably go back and purchase the Baby Sea Animals on clearance for $2.97. I’ll keep looking, as we have a Hobby Lobby and Michaels in our area, also. 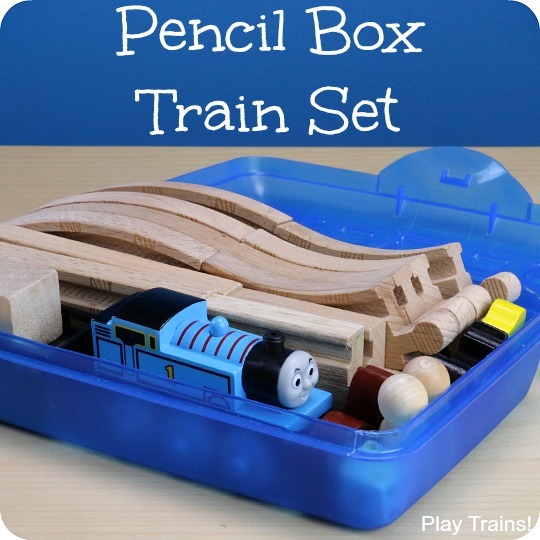 Plus, Rainbow Resource Center — a homeschool curriculum and supply vendor — sells ALL of the Toob sets, and has free shipping on orders over $50. Have a great weekend! I love this. 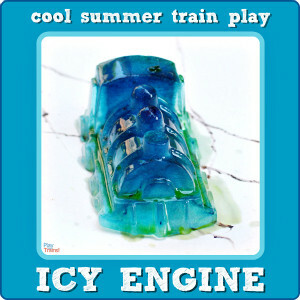 I pinned it and showed it to my five-year-old train lover who is already planning out his design. Thanks for sharing! So awesome, Jessica!! We love pretend play scenes. The details you’ve included are inspiring! Whoa. This is incredible! I’m going to have to tuck this one away in my list of things to do with my tot. I have an 8 month old that would tear into and eat each tiny animal. (By the way, we have same tiny meerkat and it’s MY favorite. Ha!) 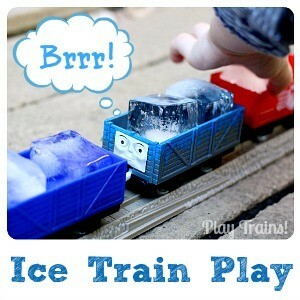 I haven’t figured out how to navigate the tiny parts of his train track without leaving choking hazards everywhere. :/ I digress. Great post!! Wow! I love what you came up with! 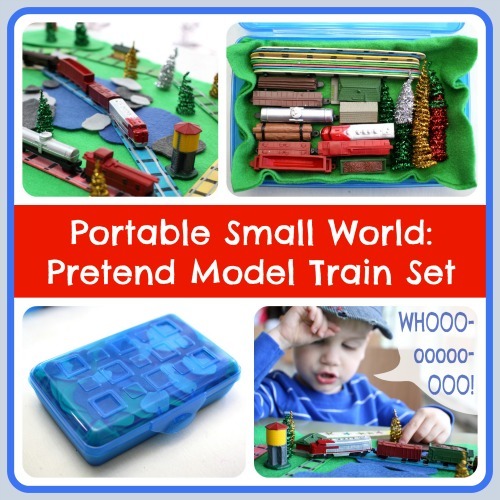 I have never thought about making a small world to become part of another play set! I am so inspired! Jessica, this is incredible! The level of detail is just amazing. 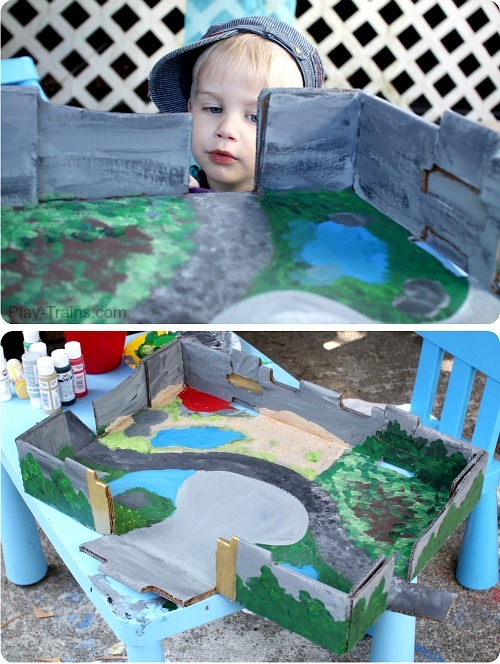 what a fantastic way to spark your son’s imagination. WOW! I absolutely LOVE what you have done for you train set. 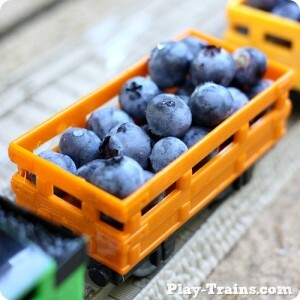 My son (and 7 yo daughter) are just getting into trains. I am excited to start being more creative in their play. Thank you for the details and post! WOW! Build it and he will play! And play and play and play! Oh WOW!!! This is amazing!!! A dream come true for a little boy! Wow. This is absolutely AMAZING!!! 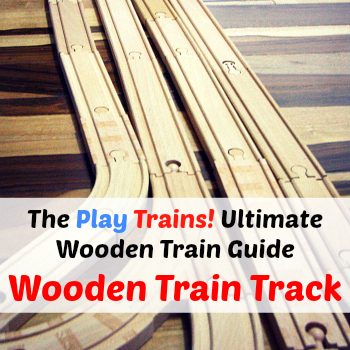 Makes me wish I had our stash of wooden trains still! You did such a great job creating this. So thoughtful and so well done. Love it!!! Thank you so much, Rachael!! And I really, really appreciate the feature. 🙂 Can’t wait to come share again this week! Ow my! This is absolutely fantastic! 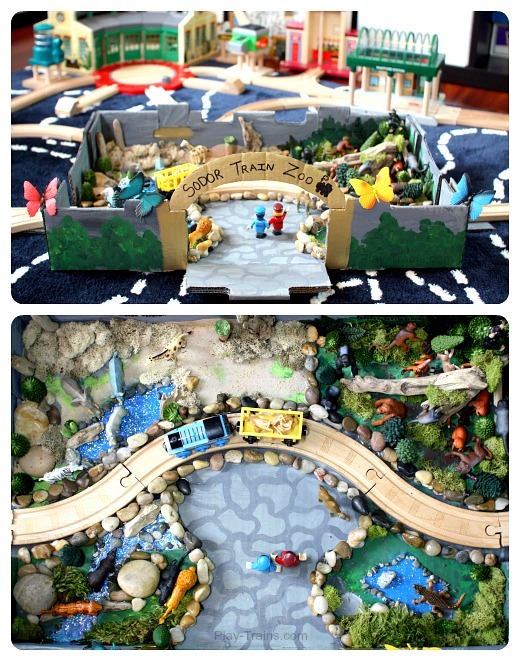 We love small world play and this is beyond amazing! Love all your attention to detail. Your little Engineer was hard at work! Thank you for your inspiration! I will be sharing today! 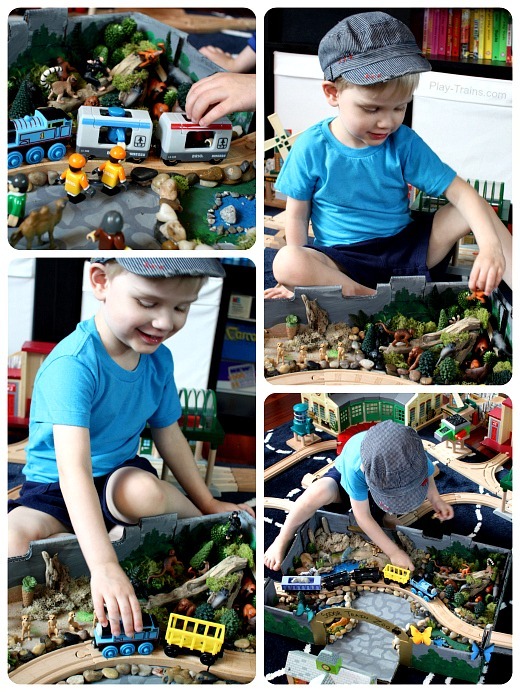 Hi, saw this yesterday and had to make it this morning for my dino and train mad son, I’ve adapted to make it into a dinosaur park using a boot box and bits and pieces I had at home; and used the same wavy track approach through so Thomas can feed the Dinosaurs. Thanks for the great idea. Oh, how fun! I love that.